Three Part Security Tickets are available in Grey, Blue, Yellow, Orange, Green or Red. The background is anti-scan, anti photocopy and has a UV watermark. They are padded in 25s, 50s or 100s with 2 tear-off strips and your design printed in black. 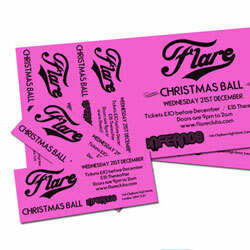 We can also print to the reverse or emboss a metallic foil or holographic foil to the perforations.